Home / Car & Marine Audio / Car Cameras & Monitors / Back-Up Cameras / Alpine HCE-TCAM1-WRA Rear View Camera & Rear Light System for 2007-Up Jeep Wrangler and Up. Alpine HCETCAM1WRA Spare Tire Reverse Camera System. Spare tire mount adapts to any spare tire wheel. Reverse camera for back-up safety. 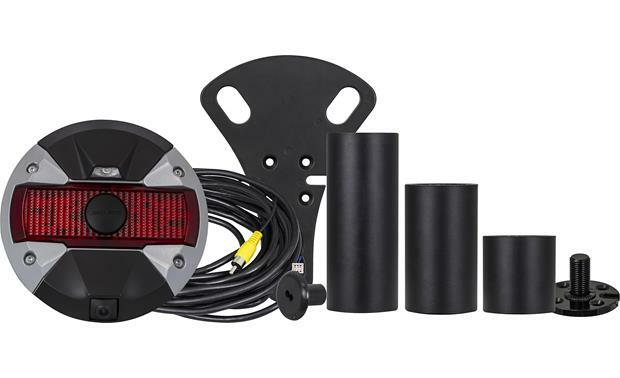 Spare Tire Camera & Light System: The Alpine HCE-TCAM1-WRA features a 3-in-1 design which consists of a rear view camera, LED third brake light, and LED reverse light in a 7″ round housing that installs onto your Jeep Wrangler’s spare tire mount. Backup Camera: The backup camera features a 1/4″ color CMOS image sensor (300,000 pixels) and a wide-angle lens (132° horizontal / 105° vertical). Its illumination range is approximately 1.0 to 100,000 lux. 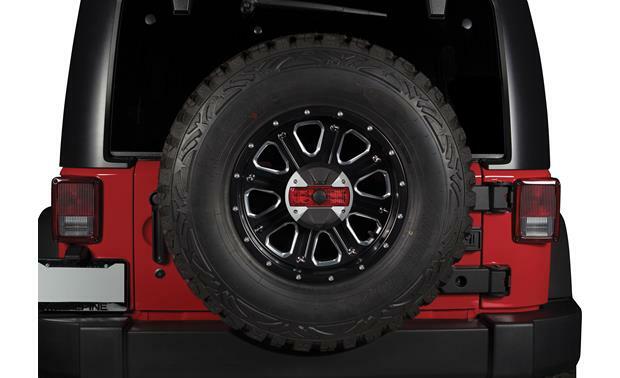 The backup camera is optimally angled within the spare tire mount to provide visibility for both near and far objects behind your Jeep Wrangler. The camera’s backup image will be displayed on your compatible in-dash receiver’s video screen. Third Brake Light: The third brake light is 6.25″ (w) x 2″ (h) and stretches across the middle of the unit to provide extra safety. Reverse Light: The reverse light is not only helpful when backing up, but also illuminates the camera’s viewing angle in low light situations. Note: This rear-view camera system is meant as a back-up aid only; never solely rely on the rear-view camera when backing-up. In addition to using the rear-view camera, always look behind you to make sure everything is clear when backing up your vehicle. The Alpine HCE-TCAM1-WRA spare tire camera & light system fits 2007-Up Jeep Wranglers (JK) with spare tire mount and factory wheel or aftermarket wheel on back (compatible with most aftermarket wheels). It works with Alpine’s WRA-series of in-dash receivers designed specifically for Jeep Wrangler, as well as other aftermarket and factory in-dash receivers with a video screen and camera input. Alpine WRA-Series: Compatible with Alpine’s 9″ Restyle dash systems for the Jeep Wrangler (X209-WRA, X109-WRA, X009-WRA, i109-WRA, & i209-WRA; all sold separately). Aftermarket Stereo: Supports aftermarket head units with a built-in video screen and a camera input that consists of a composite video jack. Factory Radio: Connection to a factory radio with a video screen and camera input requires Alpine’s HRN-CAMCH adapter (500HRNCAMC, sold separately) and dealer programming (charges will apply). The Alpine HCE-TCAM1-WRA is equipped with a proprietary & composite video connectors for greater flexibility when it comes to compatibility. The Proprietary connector is designed specifically for 9″ Restyle dash systems for the Jeep Wrangler (X209-WRA, X109-WRA, X009-WRA, i109-WRA, & i209-WRA; all sold separately). The composite video jack offers compatibility with almost any aftermarket stereo with a built-in video screen and composite video camera input. The Alpine HCE-TCAM1-WRA spare tire camera & light system is waterproof and dust proof with an IP66 rating (universal standards set for International Protection Marking of products), so it’s ready for off-road challenges like heavy dust and water crossings. The housing has a matte black finish with gun metal gray powder coat accents. It has a 7.125″ diameter footprint. The Alpine HCE-TCAM1-WRA backup camera system conveniently installs onto the spare tire mount for an integrated look and is easily removed. The HCE-TCAM1-WRA attaches to your Jeep Wrangler’s spare tire mount and is fixed using the factory lug nut or an optional aftermarket wheel lock. It is compatible with most factory and aftermarket wheels and comes with three mounting posts of varying lengths, allowing your to choose a post that fits the depth of the spare wheel. 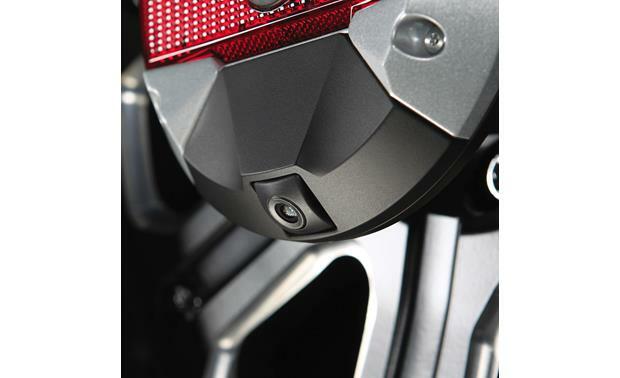 A removable rubber cap with a debossed Alpine logo covers the wheel lock in the center of the unit. the Alpine HCE-TCAM1-WRA fits 2007-up Jeep Wranglers. It is Alpine engineered for these vehicles and has features that are useful for Jeep owners. 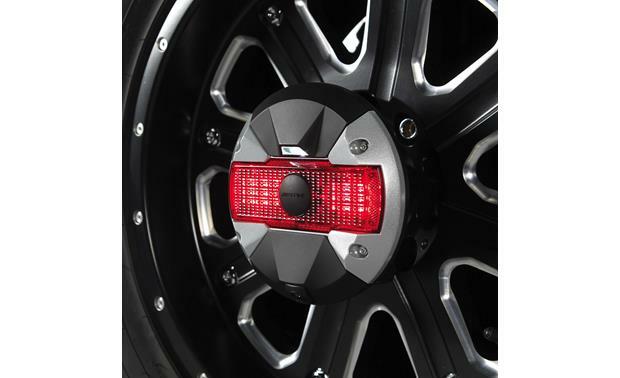 The 3-in-1 design incorporates a rear view camera, LED third brake light, and LED reverse light — all on a 7-inch round that attaches to the spare tire mount. The third brake light is 2-inches tall and stretches across the middle of the unit. The reverse light is helpful for backing up and illuminates the camera’s viewing angle in low light situations. A removable rubber cap with a debossed Alpine logo covers the wheel lock in the center of the unit. The HCE-TCAM1-WRA’s rear view camera is waterproof and dust proof, so it’s ready for off-road challenges like heavy dust and water crossings. The HCE-TCAM1-WRA attaches to the Wrangler’s spare tire mount and is fixed using the OEM lug nut or an optional aftermarket wheel lock. It is compatible with most factory and aftermarket wheels and comes with three mounting posts of varying lengths, so you can choose a post that fits the depth of your spare wheel. The HCE-TCAM1-WRA projects a color rear view image onto the in-dash screen. Installation is plug-and-play when used with one of Alpine’s three 9-inch Restyle dash systems for the Jeep Wrangler (X109-WRA, X009-WRA, i109-WRA; all sold separately).